Do you need definitive Aviation Cyber Security market data? Succinct Aviation Cyber Security market analysis? The latest attempts at cyber-attacks within the aviation industry have led Visiongain to publish this unique report, which could be crucial to your company’s improved success. 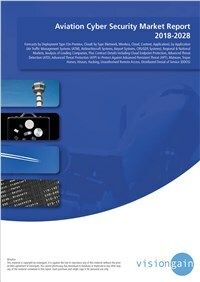 Aviation cyber security solutions are software suites designed to defend aviation networks, computers, and databases from cyber-attacks and unauthorized access. As the burgeoning global aviation industry becomes more dependent on information technology (IT) solutions and digital technologies to meet the continuously rising consumer base and changes in consumer preferences, cyber security has become a serious and urgent concern. Cyber-attackers are becoming more sophisticated in the ways they attack aviation systems and companies in the aviation market are leaving no stone unturned to make their systems comprehensively secured to ensure smooth operations and high-quality services to their consumers. The global aviation cyber security market will reach $2,691m in 2018. This report evaluates the market outlook for global aviation cyber security, detailing its size, outlook and prospective growth segmented into four submarkets and five regions for the forecast period 2018-2028. What does the future hold for the Aviation Cyber Security market? Global Automotive Cyber Security Market - Forecasts 2018-2025.